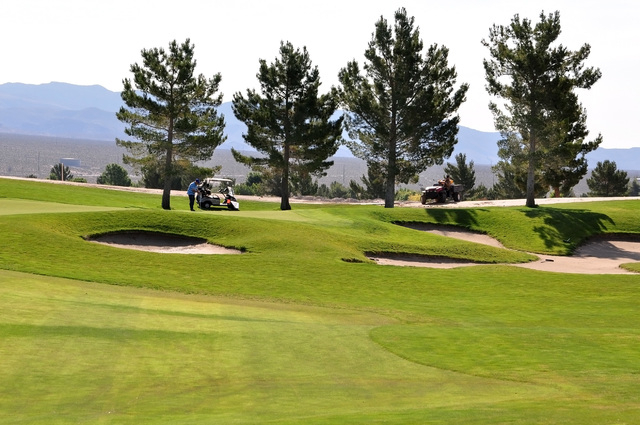 The Nevada high school state championship will be held this year at Mountain Falls Golf Course, a par 72, 18-hole course. Randy Mudge is the new golf professional and he talked to the PVT about what he thinks are the five toughest holes that the golfers will face at Mountain Falls. Mudge is the new golf pro at Mountain Falls, replacing Jason Pomroy, who moved to St. Augustine, Florida. Mudge has been a professional golfer since 1988. The golf pro moved to Pahrump a month ago from Henderson, where he was the golf professional at Black Mountain Golf Course. Mudge said the top five hardest holes on the course are holes 6, 12, 9, 14 and 5, in order of difficulty. The toughest hole is hole 6, a par 4, 420-yard hole (all yards from the blue tees). Mudge says one of the things that makes this hole tough is the yardage. Mudge said he likes to hit his ball from the tee just right of center or in the middle toward the trees. He says the green is no joke either. According to Randy Mudge the U.S. Open has its greens around an 11. The second hardest hole is hole 12 and is 425 yards. From the tee one can’t see the green because it has a slight dogleg to the left. Mudge likes to hit from the tee right center. “If you try to cut too much on this hole you will end up in the hazard on the left,” he said. He said the green is well protected. He added that once you get on, you have to contend with the slope of the green. “Nothing really is easy on this hole anywhere,” Mudge said. Mudge said the ninth hole intimidates you right from the beginning. Mudge likes to shoot right center from this tee. Mudge also said the rough is as rough as it gets. “The rough is also thick and not forgiving,” Mudge said. He explained that this hole has two greens and you have a choice of hard or harder. In this case, for the tournament, the boys will be given the right side green, which is the hardest. Like most of the greens at Mountain Falls, this green is large, fast and sloped. This hole is the fourth hardest hole. Mudge recommends aiming for the center of this green. The green slopes to the left. This hole is 420 yards. It is the fifth hardest hole on the golf course. Mudge said on this hole that the placement of your tee shot is critical. He says people make the mistake of trying to go left too much. On this hole you have a little bit of everything, water, out of bound and bunkers. The greens at Mountain Falls are rated at a 10.5.